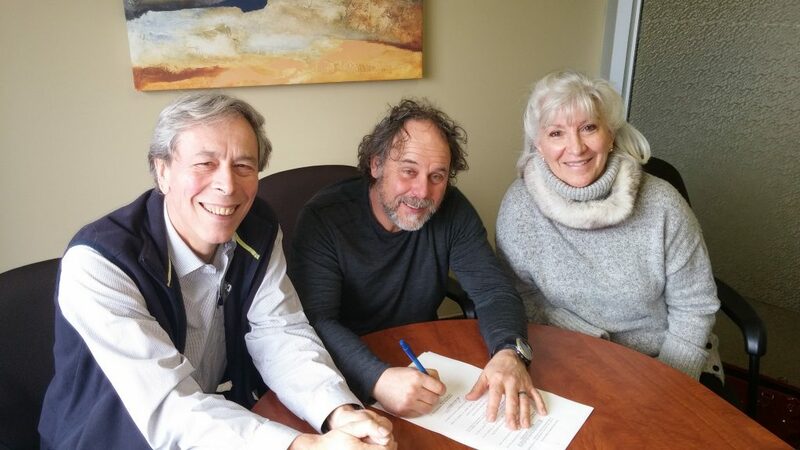 The deed of gift was approved in front of a solicitor in the presence of Jacques Leroux (president APLS), Jean Bourgault (president Development Four Seasons) and Lucie Demers (secretary APLS). PRESERVATION. The Association of the owners of the lake of Sitelles( APLS) in Austin received an inestimable present while an owner bequeathed them, free of charge, the property of common areas of a surface of 173 000 square-feet. The transaction, which was officialized in front of the solicitor on December 8th of this year, understands(includes) five beaches adding up linear 635 feet of bank, a tennis court, a playground, three pedestrian paths and snowshoes, as well as a zone of wildlife preservation. The donor is Jean Bourgault, a president of the company Development Four Seasons which developed the Domain of the lake of Sitelles in 1967. By this gesture, the businessman wanted to assure the owners the perpetuity of the rights of user of these entertaining areas and the sustainability of the quality environment of the domain. For the person in charge of the communications to the Association, Marc Paquet, this legacy is nothing less that history. ” Everything indicates that it is about a unique event in Eastern Townships, namely that an owner of a private domain gives in inheritance of spaces common to the owners of the domain that he developed. The honor and the sense of accomplishment were fundamental for Mr Bourgault and we are very grateful to him for it “supports Mr Paquet. The first negotiations on this matter began more than six years ago. The proposal was approved in general assembly, in 2015 and the legal discussions walked over several months.